Explore Earth’s changing atmosphere. Discover how our ever-changing atmosphere transports substances around the globe, protects life from destruction, and supports millions of chemical reactions. Find out how scientists track changes in the atmosphere and why they matter to everything that breathes. This web site incorporates images and information from the Atmosphere: Change is in the Air exhibition developed by the Smithsonian’s National Museum of Natural History, which was on display at the Museum through November 2006. The exhibition explores the chemistry, properties, and significance of earth’s atmosphere—the invisible envelope that surrounds and affects us all. Once living things evolved the ability to carry out photosynthesis, they began to remake the atmosphere. Atmosphere’s hitchhikers can travel thousands of miles, altering air quality and transforming life across continents. Paleoclimatologists want to know how much carbon dioxide was in the atmosphere during the Eocene. How do they find out? 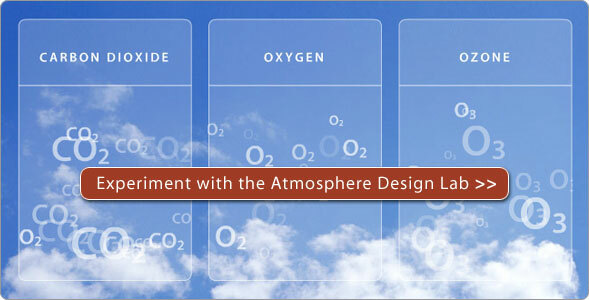 Earth's atmosphere has just the right amounts of oxygen, carbon dioxide and ozone to support life. But what if you could increase or decrease any of those vital gases? What would Earth be like then? Experiment with the Atmosphere Design Lab to find out.